Black Friday is closer than ever, with many big-name stores opening their doors on Thanksgiving Day. Whether you’re braving the crowds for the first time or consider yourself a Black Friday shopping veteran, consider these 10 last-minute tasks to prep you for the biggest shopping day(s) of the year. 1. Research circulars and map out a route. Check your inbox, mailbox and the Internet for updates on store circulars and Black Friday deals. Map out your route based on the deals you want, and remember your local mall is a great resource for discounts within walking distance of one another. 2. Make a list and stick to it. You’ll be tempted to deviate from your holiday gift list during the Black Friday madness, and that’s exactly what retailers are hoping for. Last year, Black Friday sales reached $52.4 billion, up 16 percent over the year before. The best way to stick to your budget is to stick to your list and avoid any unnecessary impulse buys. 3. Charge up your smartphone. There’s nothing worse than being without a suitable diversion while standing in line. Make sure your smartphone is fully charged and fully loaded with helpful apps. Download the Coupon Sherpa mobile app for extra discounts, the RedLaser app for instant price-comparison, and Decide to ensure you’re buying at the right time. 4. Fill up now. Fuel up the day before so you aren’t stuck at the gas station when you could be snatching up that last doorbuster. Carpooling is another great way to save on fuel and avoid the headache associated with finding your crew and coordinating your next move. 5. Get your wallet organized. Make it easy to access your preferred payment method, whether it’s cash or credit cards. Designate a place in your purse or wallet to store receipts should you need to return something, or if you want proof for a price adjustment later in the season. You can also download the OneReceipt app to keep a mobile record of all your purchases. 6. Use reward cards. If you have a credit card that offers reward points, you can get something back for all the purchases you make during the holiday season. Redeem the points you accrue for gift cards to give as gifts, or to use toward the purchase of gifts as a unique money-saving method. 7. Buddy up and layer. This way you can split your list and cover more ground in less time. Don’t forget to bundle up with layers so that you can stay warm when waiting in long line outdoors and remove excess clothing when inside. 8. Pack snacks and hydrate. Every seasoned Black Friday shopper knows there’s a lot of downtime while waiting for stores to open and the next cashier to become available. Be sure to hydrate and pack snacks to avoid wasting time and money in food lines. 9. Avoid the crowds. 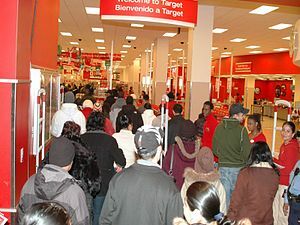 If you love a good deal but hate waiting in line, stay at home and shop from the convenience of your living room. Most stores offer the same Black Friday deals online, with some stores like Sears and Sam’s Club offering deals and doorbusters to online shoppers before Nov. 23. 10. Blow it off. Black Friday isn’t necessarily the best day to buy gifts and other holiday goods this season. You can put off your holiday shopping to as late as Monday, Dec. 17, when thousands of retailers participate in Free Shipping Day and offer deep discounts and free shipping with delivery by Christmas Eve.